Happy Chinese New Year and welcome the year of the goat! 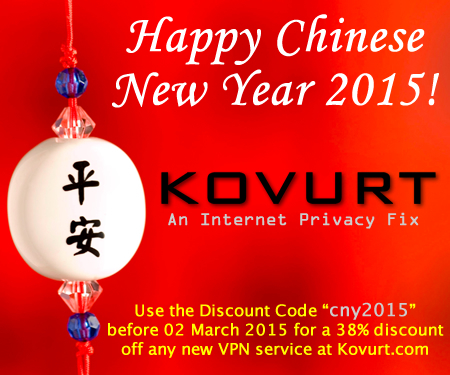 Celebrate by sending your friends the discount code “cny2015” for a 38% discount off any new Kovurt VPN service. Kovurt wants to keep all your friends safe and private this year, so spread the great news! To use the code, just select a product at Kovurt.com and at the checkout enter the code “cny2015” for a 38% reduction in the already-low price of Kovurt’s fantastic service.